← Tracking the Project Progress with using different Tables! HAPPY NEW YEAR! I Proudly announce that from 01.01.2012 I am MVP (Microsoft Most Valuable Professional) for MS PROJECT 2010! Now, suppose that you and all other resources have to stop with all activities on that Project, because you must work on another Project. After few weeks you are back on the old Project, but you should reschedule some tasks, or whole Project. This is more “reasonable” situation. Notice that all Task are moved, no matter if they were started or not. If you are not happy with provided solution, you can still reschedule your Tasks as you want, as it was described earlier in this post! Location: Zagreb, Croatia Occupation: Project Manager Interests: Project Management and MS PROJECT He was born in Zagreb, Croatia at 1963. After completing his college he started working on projects in different business areas (banking, manufacturing, automotive industry, distribution, oil companies, etc.) developing and implementing ERP systems into different companies. He has got a lot of experience working with people in different business processes and also possesses great knowledge in information technologies and financial services. Today he works as a business consultant, adn Project Manager in PERPETUUM MOBILE d.o.o. Zagreb. He is a regular lecturer for Project Management in MS Innovation Center in Varaždin, Logosoft Sarajevo in Bosnia and Herzegovina and SEAVUS GROUP in Skopje Macedonia. He was named the best lecturer of WINDAYS 2008 while his lecture was also voted as the best. In addition, he was in TOP 10 lecturers at the MS SINERGY 2009 and MS VISIA 2009, 2010. Shares first place as the best lecturer of KulenDays 2009 and 2010 and PMI Conference 2009 in Zagreb. He is also a regular lecturer in the MS Community. He is a Certified Accountant and a PMP (Project Manager Professional) and a PMI-RMP (Risk Manager Professional), MCP, MCT, and Microsoft Certified Technical Specialist - Microsoft Project 2010. 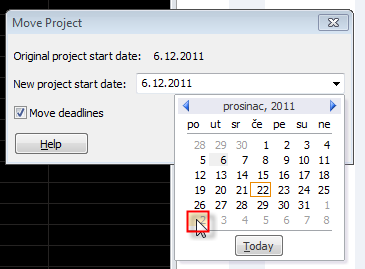 From 01.01.2012 awarded with MVP (Microsoft Most Valuable Proffesional - Microsoft Project)! This entry was posted in MICROSOFT PROJECT, MS PROJECT 2010, MS PROJECT 20101, PMI, PRoject Management and tagged Microsoft Project 2010, MS PROJECT, ms project - scheduling, PMI, Project Management. Bookmark the permalink. 2 Responses to Rescheduling the Project! A is a predecessor of B. B is a predecessor of C.
The Problem: Changing A to 15 days doesn’t cause the times to recalculate for B and C because of the work percentage for B being 50%. Is there an elegant way around this? The only way I’ve been able to do this is to delete out the percentage, add the days to A, then re-enter the percentages. That isn’t hard on such a small example. But in real life, with larger projects, it just doesn’t work. Suggestions? Congratulations on the MVP status! Your posts have been valuable for me as I figure out how to use Project 2010 with SharePoint 2010 to create a project tracking and management solution without using Project Server 2010. Thanks! How to Change View in MS PROJECT 2019?